The people united will never be divided. This is one of the rallying calls for Memphis’ version of the Occupy Wall Street movement. But who are these people? What are they united for…or united against? The people involved are old. The people involved are young. Educated and uneducated, employed and (mostly) unemployed. The one and only thing all of these protesters have in common is a desire to change things in this city, state, and country. 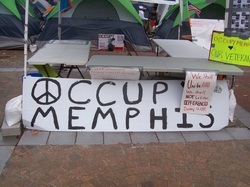 The Occupy Memphis movement is taking place in the Civic Center Plaza, right in the heart of downtown Memphis. Some of the energy for the movement has come from the heart of Cooper-Young. The Mid-South Peace and Justice Center, located in First Congregational Church, has been an early supporter of Occupy Memphis. Jacob Flowers, Executive Director of MSPJC, says the center has offered training seminars to members of the Occupy movement in three main areas. The first is "non-violent direct action." This is how one can remain non-violent, while still standing up for your rights to the police and hostile citizens. The second is "community building." This is how you learn to foster a healthy environment in your group and defuse whatever conflicts emerge within your community. The third element of successful organizing is developing the role of the "peacekeeper." The peacekeeper is a role different people in Occupy Memphis have taken on. The idea is to be a leader in keeping their area safe from outsiders who wish harm on them. Flowers said the Center has given their support to Occupy Memphis because "they are standing up for the same issues we have been dealing with for 30 years. Issues of homelessness, predatory lending, wars, the priorities of government, and restoring equity in society." He said many Occupy members were already members of MSPJC and several more members of the Peace and Justice center have joined the movement since it started. Flowers said he wants a country where working 40 hours a week will "give you enough money to provide a decent life for you and your family." He mentioned how higher education is "the new class barrier." He says it is the poor who feel it when a countries economy is broken "we spend billions on war, but we're cutting student loans and things like the Hope Scholarship." A 10-minute drive from Cooper-Young is where the Occupy Memphis protesters have created their own tent city. It's on the Civic Center Plaza in Downtown Memphis... a spacious area in walking distance of most of the many of the major local, state and federal facilities. The Occupy camp is made up of 20 or 30 tents, all different colors. The tents were donated by various people and businesses. There is an information desk, and a transparent tent for food and other supplies. People passed the time playing guitar, reading books, or talking with each other. Jade, 27, is from Colorado. He finds himself in Memphis due to a series of failed attempts at employment in Mississippi. He did not graduate from college. Jade has stayed on-site 24 hours a day for the last four weeks. Jade says he's here, “to get big corporations out of politics, corporations control everything.” He said the movement has not received much media attention in Memphis. On Nov. 13th at 3 p.m. I attended what the protesters call“general assembly” that these people do every week. General assembly is basically a meeting. Anybody can attend. The agenda for the assembly is written on a big marker board, and a different person each week facilitates the meeting. It was made clear to me there are no leaders in this movement, everyone has the same amount of power. Thirty or 40 people were at the meeting. The people of Occupy Memphis have a unique way of voting on things. Instead of raising your hand when you agree and leaving it down when you don’t, you get three choices with Occupy Memphis. To approve, you turn your wrists up, palms facing everyone else. If you disagree, but you don’t vehemently disagree, you do the same hand motion but backwards. If you vehemently disagree, you form an “X” with your arms. This is called a “block” and all blocks must be addressed for something to be approved. One thing that was voted on this time was if they should have a holiday parade, since Memphis canceled their annual Holiday parade this year. It passed the vote. Another Occupy peculiarity - when someone says something you like, or that sounds like a good idea to you, you do “spirit fingers.” One announcement that elicited a lot of spirit fingers was when a man announced Cooper-Young's First Congregational Church wants to help the Occupy Memphis get its message out. After the meeting I spoke with a woman named Sara Free. She seemed involved with the day-to-day activities of the movement. She told me that while one thing the movement encourages is voting - they try to be non-partisan. She told me many of the people don’t care about voting, because they don't believe politicians have the citizenry's best interest at heart. Free said the Memphis Police have been supportive of the movement and have never given them any problems. This is in stark contrast to the movements in other cities. When I asked what people are most upset about, she said it was an even split: some protesters are most concerned about the influence corporations have on politics; the other half is focused behavior of the financial industry in the U.S. and what that has done to the economy.